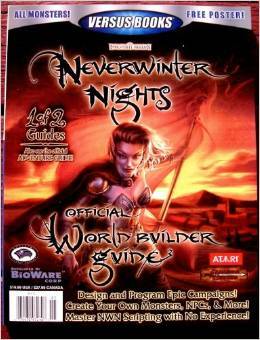 Neverwinter Nights has a lot of promise as a “next generation” of online RPGs because it enables people to build their own worlds and allow others to play in them. With great promise comes great heartaches, one of them being the trade-off between making this world building exercise easy or powerful. BioWare decided on going the harder route by exposing a massive amount of tools to the world builder. Unfortunately, this means that potential world builders face a learning curve on the order of learning how to program C. In fact, if there’s one thing you learn at a quick glance through this book, it’s that if programming computers sends you into a fit, you shouldn’t be thinking of this at all. For someone who isn’t scared of learning to program but hasn’t yet, this book fails to make that easy for it doesn’t talk about basic structures. The authors assume a fair amount of knowledge (what declaring variables means, if-then statements, case statements). For world builders who are experienced programmers, this book is annoying because it is written as a tutorial rather than a reference manual (the reference pages in the back are simply a list of monsters, not a list of the possible programming commands and where they apply). Which means the book is really for the intermediate programmer–the one who has played with coding, but who doesn’t live and breath it. For that person, this book will assist them through several of the early hurdles, as this book is a good “tutorial” for the world creation process. My guess is that programming reference book will be available someday. I sure hope so.